Very occasionally aphorisms come true. In the first instance, virtue was both its own reward and the early bird caught the worm. Or, put another way, a couple of weekends ago I got myself up and dressed on Saturday morning long before I actually wanted to be awake and took myself off to the grocery store to get it out of the way so that I could have time for the more interesting parts of my weekend. The reward for my virtue? I scored two of the few bundles of early local asparagus at Wilson Farms. In fact, I had a bag of green beans in my hand when I spied the slender green stalks of local asparagus out of the corner of my eye, turned around, dumped out the green beans and grabbed for the asparagus. It’s possible the Produce Manager at Wilson Farms laughed at me a little when I squeaked in excitement. Ask me if I cared; I had asparagus. Since then I have eaten asparagus at every opportunity I can manufacture, and I have indulged in what is basically my favorite quick Spring dinner three times in ten days – which is to say, pan seared asparagus over arugula and topped with runny fried eggs. If you drizzle leftover spicy ranch dressing over the whole thing, it’s even better. Other aphorisms that are occasionally painfully true; If you don’t like the weather in Boston, just wait 45 minutes. Some weeks I manage to coordinate what I’m serving with the weather nicely, and some weeks I’m really off the mark. Spring and Fall are particularly difficult in terms of predicting what the weather’s going to be doing four days after you make your menu plan. In Spring and Fall the weather can change radically between when I check it last thing at night before I go to bed, and when I wake up and get dressed seven hours later. However, this week I managed to totally nail it. I’m little smug about how perfectly I merged Spring bounty (asparagus & (okay not actually local) rhubarb) with rainy cold New England Spring weather (roasted butternut squash soup & grilled cheese sandwiches). Confession. I don’t really have a recipe for this soup. It’s more of a throw things in a pot and figure it’ll all work out in the end kind of deal. Sometimes I add some fresh ginger. Sometimes I add some curry powder. Sometimes I leave out the cider. Sometimes I use pears instead of apples. Sometimes I add some maple syrup, sometimes I use honey or brown sugar. Sometimes I don’t bother to roast the squash and just simmer it until it’s tender and then puree. It all depends on what I have in my fridge when I make it, what kind of flavor profile I’m in the mood for, and how much time I have. 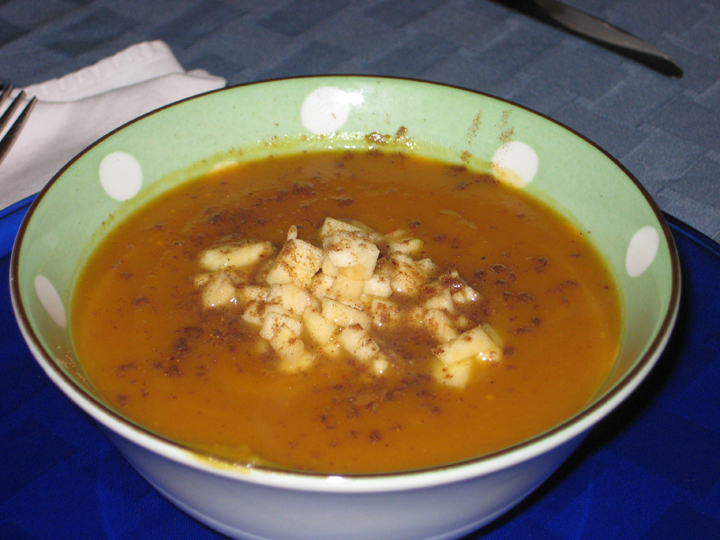 A rough rule of thumb for pretty much all pureed vegetable soups is 2-3 cups of liquid per 1 lb of raw vegetable (zucchini, butternut squash, sweet potato, acorn squash, cauliflower, etc.). I usually start with 2 cups/lb and then thin as needed/desired, but I also like my soups on the thick side – somewhere closer to a puree than a liquid, so you may want to add more liquid. However, for the record and posterity this is how I made it for Dinner. Preheat the oven to 350/375. Line a sheet pan with foil and coat very lightly with some oil. Cut the butternut squash in half lengthwise and scoop out the seeds. Season cut side generously with salt, pepper, cinnamon, a drizzle of molasses, and a drizzle of olive oil. Turn cut side down and roast 45-60 minutes, until very tender. As soon as it comes out of the oven turn the squash over so it is cut side up (it’ll glue itself to the foil otherwise). Allow to cool for 15-20 minutes and then peel off the skin (it’ll peel right off – much easier than trying to do it right out of the oven). Meanwhile (or the next night – roasted squash refrigerates nicely over night). . . . Saute the onion, apple and garlic in the olive oil & butter until tender, but not browned. Add the spices and stir to coat. Cook for about a minute to bloom the spices. Then add all the liquid, lemon juice, and roasted squash. Bring to a boil, then reduce to a simmer and cook for 20-30 minutes. Puree until very smooth. Stir in the maple syrup (start slow and add more as desired), adjust seasoning to taste with more spices, salt, pepper, lemon juice. Thin to desired consistency. Serve as is, or get fancy and top with some finely diced apple & a dusting of garam masala. * 5 lb of butternut squash will net you something on the order of over a gallon of soup. It freezes well, and I made a ridiculous amount so that I would have lots leftover for lunches and future dinners. I’m guessing that 5lb of squash serves about 12 for dinner, and 16 for lunch. Mix the goat cheese, honey and lemon zest together. Adjust seasoning to taste (may need salt/pepper/lemon juice). 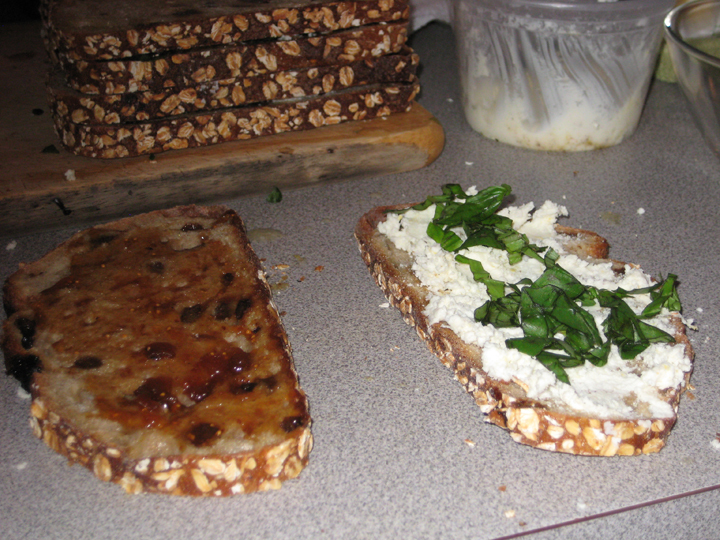 Spread the goat cheese mixture on four slices of bread. 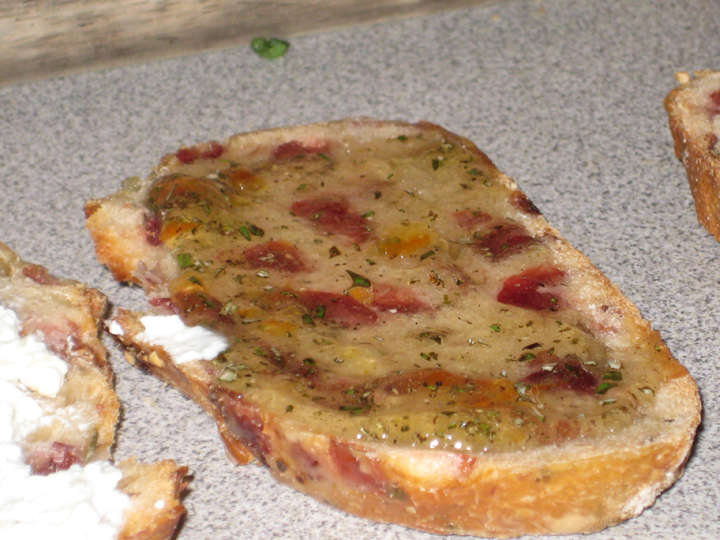 Spread the fig jam on the remaining 4 slices of bread and top with sliced basil. Close sandwiches. Brush both sides of sandwiches with melted butter and grill/toast in a pan until golden brown and melty. Mix the ricotta and lemon zest together. Adjust seasoning to taste (may need salt/pepper/lemon juice/honey). Mix the marmalade and rosemary together. Spread the ricotta mixture on four slices of bread. 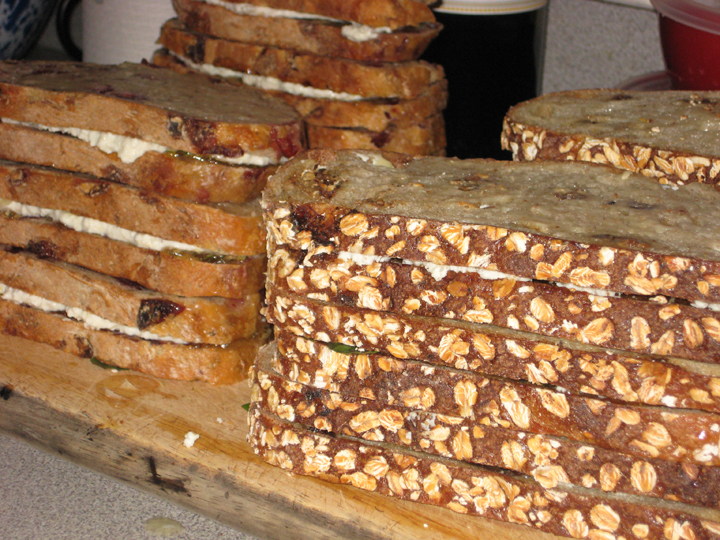 Spread the marmalade mixture on the remaining 4 slices of bread and top with sliced basil. Close sandwiches. Preheat oven to 450. 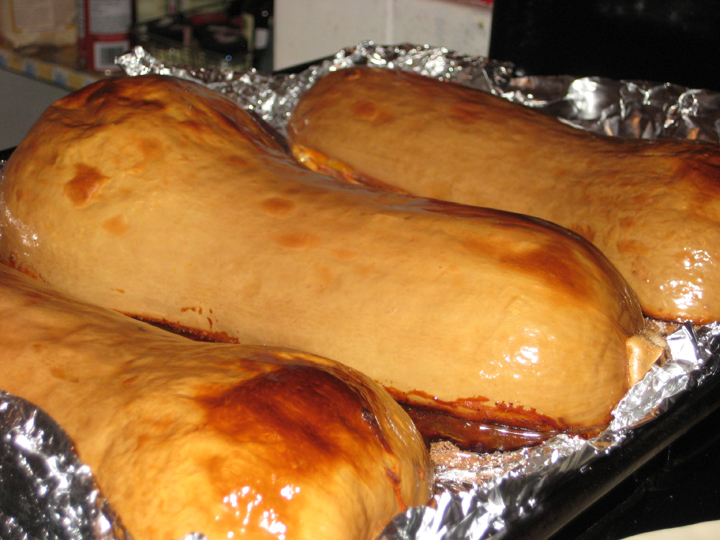 Place two baking sheets in the oven to heat for 10 minutes. Assemble your sandwiches and have them ready to go. Remove one baking sheet from the oven and arrange sandwiches on it. Top with the other baking sheet and return the baking sheet sandwich to the oven for 5-6 minutes, until sandwiches are golden brown and melty. If you have only one baking sheet, or are doing a double batch of sandwiches, arrange sandwiches in a single layer and bake for 3-4 minutes, carefully flip and bake for another 3-4 minutes until both sides are golden brown. I will confess to being a little dubious that this would work, but I shouldn’t have doubted ATK. This works spectacularly well and gave me perfectly crispy toasty bread with gooey melted cheese. Having waxed rhapsodic about the asparagus I don’t seem to have managed to take a single picture of either it, or of the salad. I anticipated local rhubarb in the store slightly before I should have. 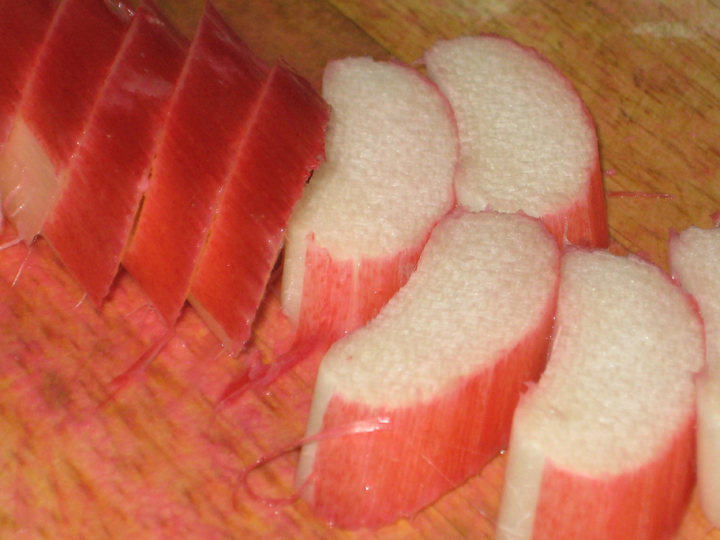 So, the rhubarb I pickled for salad this week is not actually local, but I was too wedded to the idea of the grilled asparagus and pickled rhubarb salad to give up on it despite this minor setback. So, while technically somewhere in Massachusetts there is local rhubarb, the rhubarb in tonight’s dinner actually came from the Netherlands. We’ll chalk it up to patriotism vs. locavore food cred and leave it at that. Trim the asparagus and toss lightly with olive oil, salt and pepper. Either grill on a grill, grill pan, or pan sear until tender (about 5-10 minutes depending on method + size of your asparagus). Arrange the grilled asparagus over the arugula, orange sections, and pickled rhubarb. Drizzle with dressing of choice (I usually make one from the leftover orange juice and some white wine vinegar + olive oil). Heat the cider, sugar, salt and spices until the sugar just dissolves. Pour over the rhubarb. Allow to cool on the counter for 3 hours. Refrigerate until very cold. Will keep about 3 weeks (assuming it lasts that long in your fridge).